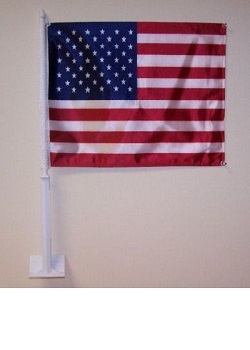 Due to the manufacturering process of the imported flags being hand made, an one inch size variation can occurr on flags. 2/17/2017 – Is this flag made in the USA? Response From Patriot Guard Riders: These are not Made in USA. 2/12/2017 – will these fit on the tourpak of a 2014 Triglide? Response From Patriot Guard Riders: This is a white plastic flag staff. We have heard of customers using these on motorcycles but can not guarantee that it will work for your mounting purpose.